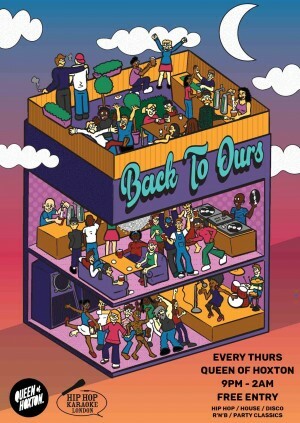 Thursday nights just got turned up to 10 at Queen of Hoxton with the new weekly house party, Back To Ours! Expect to be transported back to the house party’s of your youth, where you and your mates controlled the playlist Soundsystem, you downed booze still watered down from last time you stole it from your parents booze cupboard and you chugged a pack of cigs your older brother bought for you! You can expect 3 floors of the best bumper thumping party tunes and booty bouncing house party bangers from classic Hip-hop to House, Classic UKG too R&B floor fillers and where you have the chance to take control of the music by voting for tracks that will get played in the mix on the night as well as our resident DJs taking requests all night long! Every Thursday, Queen of Hoxton transforms into a 3 floor house party, with games, décor, giveaways and production from Fables Creative transforming the venue into the ultimate house partys of your youth. As well as our ground floor house party, head down to the basement club to join Londons Legendary Hip Hop Karaoke (£7 charge) and perform like your hiphop heroes and heroins or up to the rooftop to indulge in food, drinks and imurse yourself in our rooftop themes. For more info, go to www.facebook.com/rooftopatqueenofhoxton ! We cant wait to start/end our Thursday nights by heading “Back to Ours”! Music Policy: House, Garage, R&B, Disco, Funk, Soul & More! To ensure tickets are delivered safely and securely and to keep the price as low as possible for you, the ticket buyer, Queen of Hoxton generally uses our E-ticket system unless otherwise stated. When you purchase tickets through Queen of Hoxton, the full face value of the ticket is shown. This price is the price set by the event promoter and we pay this full amount to the promoter without any deductions.